My shame has left this blog post without pics to prove that it happened, but I did in fact forget to put baking soda into the strawberry bread. The result was an inedible mass no taller than the batter itself with the consistency of meatloaf. It wasn’t great, and it was barely touched when I brought it into the office anyways. There is a happy ending to this story. Ashamed, I took the strawberry bread home and threw it in the fridge while I thought about how to turn my creation into something other than a slowly degrading doorstep. My deliverance came as a coffee cake recipe where I replaced the crumble with my strawberry bread (run through a food processor) mixed with a bit of brown sugar. 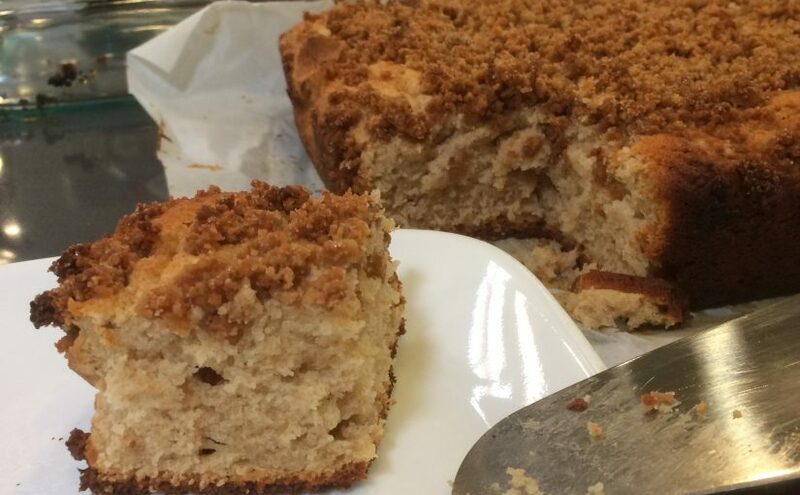 The result was a coffee cake appreciated by both Julie’s and my coworkers. Some of them noted a slight flavor to the topping, which was generally pleasant. All’s well that ends well. However, between the two creations, I ended up doing a lot of bowl-searching. In cooking and baking, I consider myself decently experienced and knowledgeable, and yet I had made one of the most basic mistakes of forgetting my leavening. I wish I could say it was the first time, but it has happened at least 1 other time that I remember. I could blame it baking too early in the morning, but that’s an excuse, not a solution. Coming from a family of amateur bakers, I thought back to my baking training and how my more careful mom and sisters would avoid something like this. Before she started making cookies, my mom would pull out every ingredient from the pantry and set them out on the counter. It seemed like a lot of work and took up too much counter space when we could just retrieve ingredients as we went. However, she would always put ingredients away as she used them, which made it awfully hard to forget something. My kitchen is much smaller than my mom’s, and I filled my cupboards to put baking supplies directly above my biggest counter. Although it conveniently allowed me to grab ingredients as I needed, it also conveniently allowed me to forget to grab ingredients as I needed. Distracted trying to unlock my iPad with icky fingers to see the recipe, I could easily skip an ingredient in the list. An hour later: hockey pucks of cupcakes or a good brick substitute. This past weekend, Julie and I began the KonMari Method of cleaning up. We had picked Marie Kondo’s The Life-Changing Magic of Tidying Up to read for book club, and after busting through it in less than a week, we figured we would try it out ourselves. Prohibiting procrastination, there’s a longer blog post that is probably coming about our experience with the KonMari Method. Specific to this post, I talked to my mom the day after we had gone through all of our clothes and mentioned a few of the big ideas from the book. As I was talking about it, however, I felt like I wasn’t saying much she hadn’t already considered. If you look in my mom’s closet, pantry, or freezer, you would quickly become lost and see her hoarding tendencies. However, if you look at her living room, bedroom, or game room, you wouldn’t find much out of place. Despite having not fully decluttered to a Kondo-like minimum, my mom certainly appreciated her belief in everything having a place and maintaining order with minimal effort through simple organization. In more ways then I care to enumerate, I’m quite a bit like my mom. We’re roughly capable of the same, minimal amount of excitement in everyday life by responding to your deepest thoughts and feelings with a flat, soul-crushing, “Okay.” My musical and culinary preferences are clearly derived from hers, and I’m sure the habits go much deeper. I joke about these similarities, but at least I have them and usually see where they came from. However, whether it’s how to remember the baking soda or keep your house clean, there’s apparently much more that I saw her do but never internalized myself. I’m pretty sure that if I asked her about some of these methods, she could probably explain why, but a lot of life doesn’t come up so explicitly. Sometimes wisdom just doesn’t quite make the jump to the next generation. There’s an old joke about someone breaking down a chicken before roasting because it was family recipe. She asked her mom why she did it that way, who asked her mom why she did it that way, who replied that it was because her pan was too small. Blindly following traditions is easy to laugh at, but I think there’s a silent majority of traditions that are lost. Maybe they’re totally transparent, or maybe they lose the reasoning paired with the process. I hope I can do a better job of passing that on, or maybe we’re just doomed to eat tough, gummy strawberry bread for generations to come. A lot of human learning is about “education of attention” rather than “transmission of representations”, if you follow the philosophy behind Tim Ingold’s research. Baking is less about the recipe, and more about the baker noticing or not noticing the details in the programming of the cake. Wisdom accumulates slowly, so those traits we acquire in our upbringings are deep not only within individuals, but also in families.